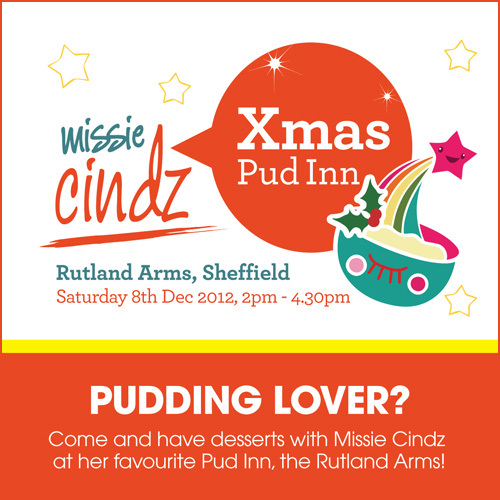 You are invited to attend Missie Cindz’s seasonal Pud Inn Club on Saturday 8th December held in The Rutland Arms (upstairs) starting 2.00pm – 4.30pm with a special Christmas-themed pudding menu. Christmas is not Christmas without a pudding or FIVE! So start your afternoon in style with me and enjoy a delicious boozy or fruity rich, stodgy and warm dessert handmade by our city’s local bakers, chefs and Pud Inn diners. This is a ticketed event and places are limited, Pud Inn tickets are £8 per person and will be available to purchase at the bar from Monday 12th November. Sorry but I won’t be able to provide or reserve Pud Inn tickets (via email) before this date. Please do look out for more event details on this blog and tweets by following the hashtag #MissiesPudInn leading up to our event or you can join our facebook event’s page. Pud Inn is a friendly and informal afternoon with other pudding enthusiasts from Sheffield and beyond. Our previous pudding themes have included Favourites, Christmas 2011, Fruity, Chocolate and Party. These are seasonal, playful gatherings I curate (4 events per year); Yes, Pud Inn is rather naughty and it’s unhealthy but I think everyone is allowed a guilty pleasure once in a while – after all – “what’s life without treats!?”. Thank you to our local diners, Pink Little Bean, Lil Miss Hungry and Emma Fisher for their sweet feedback and write-ups on my last event, Party Pud Inn. Adding to the Christmas Pud Inn experience there will be a desserts ‘treats’ table; where YOU, the diner can bring in homemade Christmas themed treats or shop-bought favourites for us to try and share, we like to try new things (and from what I’ve seen, our diners are adventurous too! ).